Commercial Restroom Products announced the SanitGrasp® door pull/handle. The H1N1 "swine" flu is driving up demand for products such as the SanitGrasp®. This door handle is in the shape of a "J", thereby allowing a person to open a door with their closed fist, wrist or forearm. The SanitGrasp® is made of a sturdy 12-gauge stainless-steel plate and also includes antimicrobial protection. It also is easier for the disabled to use than a traditional door handle. It was engineered to easily replace an existing door handle. Koala Kare Products, division of Bobrick, has introduced their re-engineered and re-designed KB200 Baby Changing Station. Major features are all-new contemporary design and the Bear-of-a-ChassisTM , able to hold a 200-pound static load. Engineered to provide virtually no deflection, the KB200 substantially improves safety and parental peace of mind. The heavy-duty, multi-point mounting chassis features 11-gauge steel unibody construction, and the changing station bed provides a smooth, seamless finish absent any sharp edges or pinch points for baby comfort and ease of cleaning. 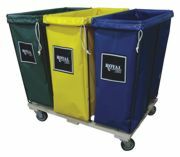 Royal Basket Trucks offers a wide range of carts for storage, recycling, sorting, athletics and laundry applications. Storage needs for athletic equipment can be met with a simple basket truck or with a sorting cart with separated compartments. 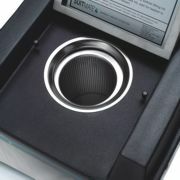 Vinyl covers and solid locking hinged tops are available. All Royal carts glide across your floors without much effort on non-marking polyurethane casters. Royal offers 12 colors of tear-resistant, flame-retardant vinyl. Laundry Loops® are the cleaner and greener alternative to using mesh laundry bags. Garments get cleaner and more sanitary—and dry in half the time. Laundry Loops® also eliminate snagged garments and dented dryer drums caused by brass pins. Laundry Loop® with Sock Snare (Pat. No. 6,038,748) is the original laundry strap—and it's the most efficient way to manage group laundry. Keep the pool out of your locker room. Pool water damages your locker room one swimmer at a time. Wet, dripping swimsuits harm facilities by rusting metal lockers, delaminating wood finishes, and ruining carpets and furniture with mold and mildew. SUITMATE uses an exclusive, high-speed spin process to pull out water and make a wet suit drip-free in seconds, without heat. ERC Wiping Products is a leading supplier of low-cost hand and bath towels to aquatic and recreation facilities. The most popular choice is white hand and bath towels with a distinct stripe down the middle. The unmistakable stripe helps prevent theft and loss of towels in facilities. The stripe is available in blue, green or gold. ERC also carries a wide variety of other athletic towels available in your choice of color, size and thickness. Dex-O-Tex® Terracolor is a thin-section flooring system consisting of multi-colored natural aggregates embedded in a pigmented epoxy matrix and incorporating clear epoxy filler and sealer coats, which resist heavy abuse and impact. Its jointless design eliminates the problem of odor-causing bacteria settling in grout joints between conventional tile. Dex-O-Tex® Terracolor is easily cleaned and may be turned up into a coved base for added sanitation. It is available with an optional antimicrobial additive to further inhibit the growth of bacteria, fungus and other microbes commonly found in restrooms and locker rooms. All in one unit, or multiple units, Fred Lunt Industries' customized Sports Storage units are completely modular and custom designed to fit your room's dimensions and meet your storage needs. Start with a single unit or entire room and add on at any time. 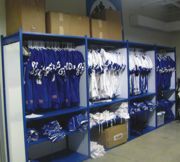 Options include hanging uniform racks, double hanging uniform racks, garment racks, hanging sports uniforms, sport equipment storage and lockers.